Rhesus is a son of “Roundup”, a sire who again produced a great number of daughters. Production of milk is not the top trait, but feet and legs, good conformation and all around strength are his primary points. He is an all around sire with ability to add substance to cross breeding. He stems from a “Waterberg” daughter on the maternal side. For more detail, watch this video, and see more on Rhesus Pedigree below. 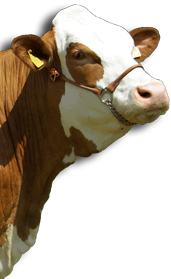 Main genetic characteristics – Allroundsire, Feet & Legs, Udder. Learn more about Fitness, Type traits, Further characteristics and pedigree of Rhesus at the Bayern-Genetik website.